Everybody knows Pat Wilson from the popular rock combo Weezer. Really, that's who he is - he even introduces himself as such in the above video, which comes to us from O2 Academy TV. When Weezer played a sold-out show at the O2 Academy Brixton a few weeks ago, Wilson was subjected to 'drummer cam' - four cameras were set up around the kit to capture a truly intimate, up-close-and-personal look at his performance. Sure to be enlightening in other ways is the upcoming Weezer Cruise (which sounds like a truly splendid time to us). If you missed the pre-sale sign-up deadline, which was last Sunday 24 July, you might still be in luck when the regular sale commences on 3 August. 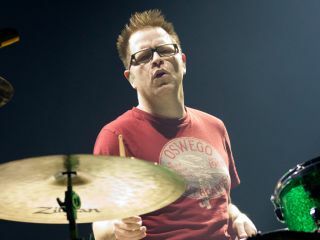 Until then, enjoy these two other 'drummer cam' videos of Pat Wilson playing with Weezer, supplied by O2 Academy TV.